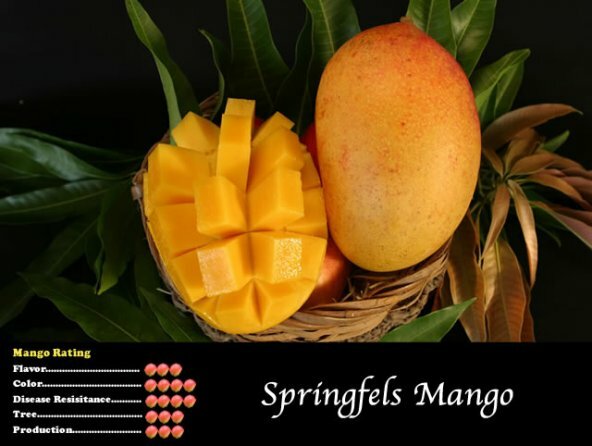 &QUOT;SPRINGFELS&QUOT; IS A HADEN SEEDLING SELECTED IN WEST PALM BEACH, FLORIDA IN 1925. THE FRUIT IS LARGE (TO 3LBS), COLORFUL, AND OF GOOD EATING QUALITY. THE TREE HAS A LOW SPREADING HABIT BUT CAN ATTAIN HEIGHTS OVER TWENTY FEET. IT IS NO LONGER A POPULAR VARIETY DUE TO UNEVEN RIPENING AND THE AVAILABILITY OF SUPERIOR CULTIVARS. THE FRUIT RIPENS FROM JULY TO AUGUST.